Ladies and Gentleman, it is time for another DIY! I just can’t help myself. Those feathered tablecloths I posted about have been driving me crazy. I kept thinking, how can I use that in my daily life? How can I make that a little more casual? You only get married once. Well, some of us more than others. But still, I want to throw birthdays, and dinner parties, and holiday meals on a feathered tablecloth. Who wouldn’t? And then it hit me. Forget white; forget fancy. And it’s so easy you can make one too! 1. First, pick out a fabric. Choose something easily washable, so you don’t have to worry about spills and stains. 2. Choose a feather trim. Make sure the colors blend well, and remember that you can make the trim yourself, or buy a pre-made one. 3. Once you’ve chosen and cut your fabric, now comes the fun part. If you want to, you are welcome to sew the trim on by hand (or by machine). However, I bought myself some fabric glue and got to work. Spread the glue on the back of the ribbon and then press down with your fingers for about 5 seconds to seal the glue. I suggest doing small sections at a time. Just glue and pinch, glue and pinch, glue and pinch. 4. Viola! 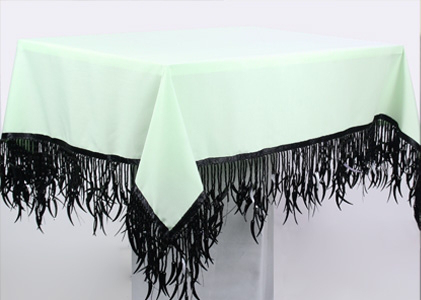 You now have an amazing, handmade, completely original feather tablecloth. Bring on the fun!